Promise unfulfilled denotes the playing career of right-handed pitcher Mike Brown. When the Red Sox drafted the Clemson University star in the second round in the 1980 amateur draft, Boston Globe baseball writer Peter Gammons wrote that “two teams whose scouts I respect” considered Brown among the top 20 prospects in the country.1 But after six seasons with the Red Sox and the Seattle Mariners and a less-than-mediocre 12-20 won-lost record, largely as a starter, Brown was done as a major-league pitcher. Michael Gary Brown was born on March 24, 1959, in Camden County, New Jersey. In 1977, when he pitched for Marshall High School in Falls Church, Virginia, he was drafted in the 20th round by the Atlanta Braves, but chose to attend Clemson University. Pitching for Clemson, Brown had a 23-9 record with a 3.25 ERA, mostly as a starter. He was second-team All Atlantic Coast Conference in his first year (1978) and first-team All ACC his last year (1980). In the latter year he pitched a seven-inning perfect game in 1980 against UNC-Wilmington. Among his teammates was future major leaguer Jimmy Key. Brown led the Tigers in victories in 1978 and 1980 with nine wins each season. These high marks led the Red Sox to draft Brown in the second round in 1980, the 48th overall selection. Brown got his feet wet in professional baseball by pitching in 17 games for the Winter Haven Red Sox of the Class-A Florida State League in 1980. He was 3-4 with a 4.31 ERA. Perhaps Brown’s best year in professional baseball was 1981; in 21 starts he was 14-4 with a 1.49 ERA for the Winston-Salem Red Sox of the Carolina League. Brown led the team in wins, ERA, complete games, shutouts (6), innings pitched (145.0), strikeouts (144), WHIP (0.917), and strikeout/ walk ratio (3.69). That earned him a promotion to Bristol of the Double-A Eastern League for 1982. There, Brown made 15 starts, going 9-6 with a 2.45 ERA, and earned a September call-up (along with teammate Oil Can Boyd) to the third-place Red Sox. Brown debuted on September 16, 1982, in Detroit, throwing the final inning in a 4-2 loss to the Tigers. He gave up a single but no runs. Eleven days later, on the 27th, he pitched the final inning against the New York Yankees at Fenway Park. Dave Winfield doubled to lead off the inning but tried to stretch it to a triple and was thrown out. Brown retired the next two batters. His third and final appearance came against the Yankees in New York. He came into a game tied 3-3. Brown worked four innings, allowed five hits and a base on balls, but no runs, and picked up the win when the Red Sox scored twice in the top of the 11th. Brown’s first major-league start came in the Red Sox’ third game of the season, against the Texas Rangers. He pitched six innings, giving up two runs while striking out seven. He got a no-decision, as the Red Sox won 8-5. Brown ended April 1-2 with a 6.00 ERA. His strikeout-to-walk ratio was less than one. May was a bounce-back month, though. He was 3-1 with a 2.75 ERA in six starts (three complete games, including a shutout of the Seattle Mariners, his future team). Brown continued his hot pitching through mid-June, but cooled off at the very end. He was shut down for the entire month of September due to a sore arm, which was a lingering effect of a pulled groin muscle he suffered in Toronto on May 28. He ended the year 6-6 with a 4.67 ERA. Houk went into the offseason with high hopes for Brown. “If Mike Brown can throw a lot during the winter and get his arm in good shape before we get to spring training, he can be a winner,” the manager said.4 Brown did rehab during the offseason,5 and broke camp with the Red Sox after spring training in 1984.The rough end to the 1983 season continued. In the last spring-training game, Brown was drilled in the shin by a Steve Garvey line drive. Initial reports indicated Brown would not be ready for his first start of the regular season.6 Brown defied the odds and returned to action a week later. This return might have been premature, as he was roughed up in his first start, lasting only a third of an inning in Oakland and giving up six runs. May was once again his best month of the year, when he brought down his ERA by over a run to 5.40. Boston sent him to Pawtucket for some additional work. Brown started 12 games for Pawtucket, going 6-3 with a 3.40 ERA, but this success did not translate to the major leagues when he was recalled. Over his last four outings, Brown had an ERA of over 10.00, and wound up with a record of 1-8. Brown did not make the Red Sox out of spring training in 1985, but was called up after three starts at Pawtucket. After two starts totaling 3⅓ innings, with eight runs given up. Brown was sent back to Pawtucket in mid-May to pitch mostly out of the bullpen. Brown’s time with Pawtucket was not much better than with Boston, as he had a 2-5 record with a 5.60 ERA in 20 games. Brown came to spring training in 1986 with a purpose. “It’s time for me to either be in the big leagues or be with another team,” he said. “I don’t have any arm problems; I just need the chance to throw. Nothing against the Red Sox, but if I don’t get a chance to pitch, I should move on. I know I can pitch. The thing I don’t understand is why I got filed away last year.”7 He carried that attitude over to the regular season. His first start for Boston was a seven-inning two-run win over the White Sox. 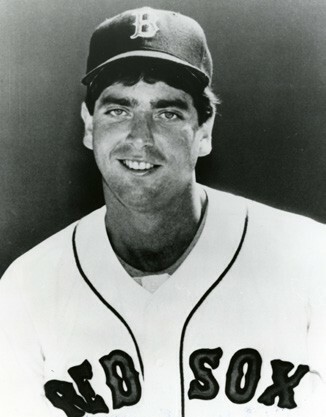 Brown was a mainstay in the rotation in May and June, but was replaced when the Red Sox traded for veteran Tom Seaver. Brown was moved to the bullpen, where he struggled. In four relief appearances, he gave up eight runs in 4⅓ innings, and he was sent back to Pawtucket in July. In August Brown got his wish of being on another team when he was traded to Seattle on the 22nd in a five-player deal, a momentous one as it turned out. While Boston was gearing up for its eventual pennant, the Mariners were mired in last place. The trade netted the Red Sox Spike Owen and the star of the 1986 ALCS, Dave Henderson. It was a two-part trade; on the 19th, Rey Quinones and cash went to the Mariners with players to be named later. Three days later, the two players named were Mike Brown and Mike Trujillo. Brown was given two starts by Seattle in August; his first was a disaster, while his second showed promise. The September call-ups again pushed Brown to the bullpen, where he continued to struggle in four relief appearances. The last year Brown wore a major-league uniform as a player was 1987. He spent the entire season in Triple A except for one mid-August outing for Seattle at Minnesota. He lasted only a third of an inning, giving up three hits and two runs. He was returned to Triple-A Calgary, and sent to Baltimore in a trade for fellow minor leaguer Nelson Simmons a week later. Brown made one start for Triple-A Rochester. Brown signed a minor-league deal with the Cleveland Indians in the offseason, and played the entire season at Triple-A Colorado Springs. As primarily a starter, he went 10-9 with a 6.12 ERA. That was his last season as a player in Organized Baseball. For the next three seasons Brown managed Cleveland’s Class-A affiliate in Columbus, Georgia. In 1992 he was named pitching coach for the Yankees’ Triple-A affiliate, the Columbus (Ohio) Clippers. During those two years, Brown worked with many future major leaguers, including Sterling Hitchcock and Bob Wickman. Brown was promoted to the Yankees as a major-league bullpen coach in 1994. Brown returned to the Indians organization in 1995 as the pitching coordinator. He also held the titles of assistant director of minor leagues and special assistant to the GM until he was named pitching coach in 2002. Brown helped the development of CC Sabathia, Jake Westbrook, and Cliff Lee. Brown was let go at the end of the season, and moved on to Japan for four seasons, including a stint as the pitching coach for the 2006 Japan Series champion Hokkaido Nippon-Ham Fighters. Brown returned to the United States and joined the Arizona Diamondbacks as a scout in 2007. In 2015 he completed his ninth year in the position. That same year his son MJ Brown was an infielder on the baseball team at Lee University in Cleveland, Tennessee. 1. Peter Gammons, “The Go-All-Out All-Star Team,” Boston Globe, June 13, 1980. 2. Peter Gammons, “Head Start for Sox; Mike Brown Is Thinking Man’s Pitcher,” Boston Globe, March 31, 1983. 4. Peter Gammons, “Houk Makes His Pitch for the ‘84 Season,” Boston Globe, October 4, 1983. 5. Lewiston (Maine) Journal, February 27, 1984: 11. 6. Peter Gammons, “Brown Hit in Leg, Will Miss At Least 1 Start with Bruise,” Boston Globe, April 2, 1984. 7. Dan Shaughnessy, “Order Is Maintained,” Boston Globe, March 06, 1986.